I whispered to my son as I tucked him into bed last night "you can never ever know how much I love you" and he giggled and said "yes, Mummy". OMG, why must he be so adorable and sweet and cute and funny and smart and the most fantastic child I've ever breed? He lay there in his baby sleeping bag that I had earlier on in the day promised him he could use, and he was listening to Philip Glass "The Hours" soundtrack like he does practically every night. After storytime (and he almost always asks for the Kiwi Christmas book) I always ask what he would like to listen to; choices are noise, music, or nothing. His answer used to be noise (a combination of waterfall and raindrops via an iPhone app), but now it's music (which is always Philip Glass). Kien's been watching lots of old videos of himself; from when he was just a little thing that could barely move, to when he started rolling, to when he was commando crawling, to climbing, to wobbly steps, to using sign language, to forming words, to running, and everything in between. It's amazing how quickly one forgets the different stages of their development and how they've gone from this worm-like creature to a walking-talking precocious human that pushes every boundary you've set and stubbornly chooses time-out over having to back down. He's going to be two and a half on the 29th of this month - 2 1/2 years old! My little baby boy who now says "I'm not a baby, I'm a toddler", who can count up to 15 in alternates, who can recognise half of the letters of the alphabet, who sees a picture of the koru inside an outline of an aeroplane tail and yells "there's a plane! ", who gives kisses and high fives readily, who still loves to cuddle his koala when he's drinking milk - my little boy, no longer a baby but who will always be my baby. I know, I can see the book "Love You Forever" playing out as I type this. Terrifying. It was nice to see Warren and Margaret here in Auckland for a few days last week. 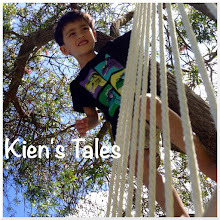 It was two very late nights for Kien, but he coped really well. I think he enjoyed showing his granddad the videos on his iPad. Check out this picture of Jef as a tot playing in the creek with is dad. Look at Jef with his sister, Sandra. So cute. I loved seeing the old slides on Mothers Day. We really have to get them digitised. We created face collages on paper plates at playgroup last week. At the end of our decorative/creative portraits I'm pretty sure our plate looked more like an abstract meal than an actual face. Oh well, so long as the kids enjoyed sticking stuff down with PVC glue. Trust me, Kien did enjoy himself despite what this picture suggests. Kien loves eating beans. I know! As if he loves to eat anything - not even ice-cream. But yes, beans. On Saturday he only wanted beans for lunch. Kidney beans are his favourite, but he will settle for chick peas too. Conked out after a long day, with his sleeping bag on for the second night. My little one LOVES kidney beans and chickpeas too, he asks for them as a snack sometimes. What a lovely post, I'm off to look at our videos of our Monkey.